Ian Baird fielded his side in a 4-4-2 formation with a defence of Ross Bottomley at right-back, 17-year-old Ben Wilson at left-back and a centre back pairing of Tom Jordan and Andy Forbes in front of new goalkeeper Mike Green (former Bristol Rovers). In midfield, Richard Gillespie and Ryan O’Hara played on the left and right sides respectively of Jamie Brown and Danny Smith, who formed an experienced central midfield partnership. Andrew White and Jamie Slabber led the attack for Eastleigh against Frank Gray’s Dragons. Two of the recent recruits who joined Eastleigh’s ranks just yesterday made the bench, with young winger Jordace Holder-Spooner, formerly of Southampton's academy, and strong versatile defender/midfielder Jordan Rose (ex-Stockport County) both included in the squad. Those who didn’t make the 16 were former Southampton academy/reserve defender Ryan Tafazolli, as well as home grown Eastleigh talent Liam Hibberd, Reading loanee Frankie Raymond (injured), Jack Vallis, Adam Cashin-Murray and Gary Pryde. Eastleigh made a bright start to the game with livewire forward Andrew White nodding the ball past his marker in the opening minutes before seeing his shot from 20-yards being deflected for an early corner. In the third minute, a Basingstoke free kick by Wes Daley was curled into the Eastleigh penalty area where David Pratt nodded the ball narrowly over the cross bar. Two minutes later, Eastleigh had another sight of goal when a long throw from the right by Ross Bottomley was flicked on by Jamie Slabber into the path of Richard Gillespie, who in turn headed straight at goalkeeper Ashley Bayes from close range. With the game still in it’s infancy in the tenth minute, Eastleigh conjured up one of their better moves of the game when Ryan O’Hara fed a neat ball down the right channel for Andrew White. White did well from the by-line picking out Gillespie with a pinpoint cross in the centre, only for Bayes in the Basingstoke goal to make a good stop to deny Gillespie’s goal-bound header. Against the run of play, Basingstoke opened the scoring through DELANO SAM-YORKE in the 13th minute. Sam-Yorke broke up field down the left-hand side after the ball was helped on in his direction, and the Basingstoke forward did all the rest from there. Breaking into the 18-yard box, Sam-Yorke drilled the ball low with a left foot shot inside the post to Mike Green's left. It was a good finish right in the corner of goal, but disappointing for Eastleigh to concede, almost out of nothing. David Pratt attempted a bicycle kick in the 16th minute but failed to get a powerful connection on the ball to trouble Green. The visitors seemed to take the ascendancy after their goal and could have gone further in front after Ben Wilson brought down the goal scorer just outside the penalty area. The free kick came to nothing in the end, but it was a dangerous position to give away a cheap set piece. Eastleigh made their first substitution with a little over twenty minutes played. There didn’t appear to be any injury, instead it looked to be a tactical switch from the manager who perhaps felt young Ben Wilson looked a little nervous on his first league start for the club. Jordan Rose came on for Wilson, which meant a couple of positional changes with Danny Smith switching to right back and Ross Bottomley to left back to allow Rose to play in the centre of midfield. Basingstoke came close once more when Wes Daley’s 25-yard effort flew narrowly over the Eastleigh cross bar midway through the half, before Eastleigh fell further behind. DELANO SAM-YORKE added his and Basingstoke's second of the game with a close range strike following a low cross from the right into the Eastleigh six-yard box. The half ended fairly quietly with the visitors looking comfortable with their two-goal advantage. Chances of note saw Jamie Slabber hit a speculative effort from distance that sailed a long way off target ten minutes before the break, before a good cross from Gillespie just evaded the head of Jamie Brown by a matter of inches. Just before the break, former Eastleigh winger Shaun McAuley was replaced on his return to the Silverlake Stadium due to an injury, Jide Ogunbote came on in his place. With a lot of work on their hands heading into the second half, Eastleigh made their second substitution of the game by introducing Jordace Holder-Spooner at the break in place of Ryan O’Hara. 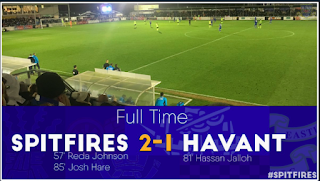 Holder-Spooner looked to make a good impression on his Eastleigh debut and tried his best to influence the game with a first-time left foot shot in the 55th minute, after Jordan Rose had flicked the ball into his path. The shot on this occasion was just a little too high. Richard Gillespie held the ball up inside the Basingstoke penalty area following a long ball forward from defence just shy of the hour mark. The former Bashley forward made a great turn before what looked to be a foul, sent Gillespie tumbling just as he was about to shoot. The referee was uninterested in any claims for a penalty. Basingstoke’s David Pratt came close with a good effort from a tight angle on the right, as his shot was driven dangerously across the face of goal, meanwhile at the opposite end in the 68th minute, a long ball up field by Eastleigh goalkeeper Mike Green saw Andrew White chase down well and latch on to the loose ball, which he controlled, before firing a shot over the bar. Eastleigh then had a spell towards the latter stages of the half where Basingstoke where pinned back in their own penalty area for a minute or so. 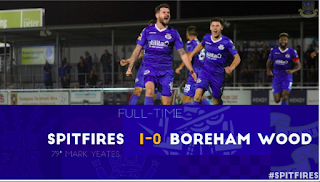 The Spitfires kept sending the ball back into the danger zone by applying pressure which saw the ball bouncing around threateningly a number of times before the visitors could scramble clear. 16-year-old Sam Wilson came on for a good run out towards the end of the game and showed plenty of enthusiasm and effort. It was Wilson’s through ball into the path of Holder-Spooner that created the best chance for the Spitfires to come anywhere close to pulling a goal back to reduce the deficit. Holder-Spooner had found space to the right of goal but his shot was charged down well and Eastleigh had to make do with a corner. 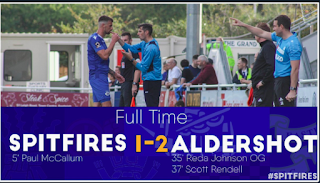 Six minutes from time, Delano Sam-Yorke almost added a third goal for Basingstoke, which probably would have flattered the visitors a little, but the two-goal striker was denied a hat-trick after a quickly taken free kick and smart save by Mike Green. Eastleigh’s man of the match Jamie Brown, who showed desire and commitment in the middle of the park throughout the game, sent a flighted pass into Slabber in the closing minutes of the game. There was to be no consolation goal, only a corner kick as Basingstoke defended well. Next up for Ian Baird’s new-look Eastleigh sees the Spitfires travel to Blue Square Bet South newcomers Truro City looking for improvement on Tuesday night.